A total body workout from one machine! Power past your fitness goals with the Fortis 4-in-1 Elliptical Cross Trainer. 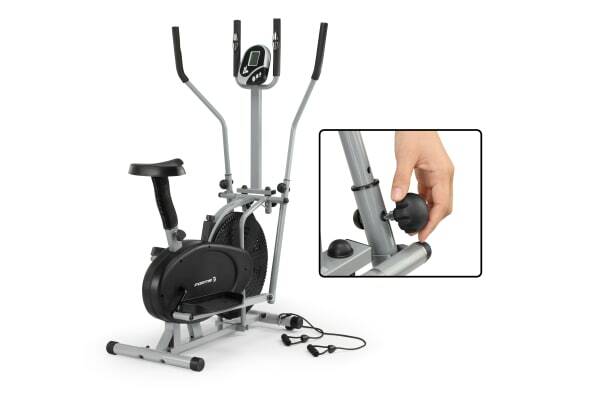 Escape expensive gym memberships and avoid bulky gym equipment with the Fortis 4-in-1 Elliptical Cross Trainer. 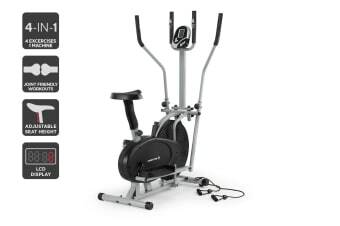 Boasting a compact size that fits into even crowded homes, this total body workout station targets your upper body using the moving handlebars, while the non-slip pedals target almost every major muscle in your lower body. For the ultimate full body, low-impact workout, the resistance bands allow you to focus on your chest, back, shoulders and arms, with tricep extensions, bicep curls and much, much more! The easy to use LCD screen lets you track calories burned, speed and distance covered in real time, so you can easily adjust the resistance level to meet your needs. Even a low intensity session on the Fortis 4-in-1 Elliptical Cross Trainer can help you burn up 450 calories per hour.